Happy Monday, everyone! Time for some inspiration from the Challenge Team! Annette, Shelly, and Laura Jane are here to share their takes on the December Waffle Flower Challenge! Join the fun by linking your projects to our challenge too! Our previous challenge winner: Anika Lerche is also sharing with us today! Anika says: For the background I stamped the sentiments in white pigment ink. I let it dry overnight. Then I stamped the dogs in dye ink over the white ink. For the main image I stamped the dog, added some dimension with Prismacolors and some details with a black gel pen. Using On My Mark Stamp Set, On My Mark Die, Monochrome Stamp Set How cool is the hand stamped sentiment background on Anika's card? We also love that crisp black speech bubble for the sentiment! Thanks Anika for including the detailed shot! Using Stocking Stamp Set, Stocking Die, DT Mix Stamp Set, Flower Circles Die Annette says: I first stamped all the images on a scrap piece of paper. Using the Stamp Layering technique I stamped the stocking pattern from Stocking stamp set. Next I stamped over the heart from DT Mix this fun sentiment also from the Stocking stamp set. I LOVE this sketch so I added that into the mix also created a fun watercolor background just to give it a little more color. We are totally in love with this wonderful free-style collage look: the teal heart, the little dotted circle and the watercolored background! We also love that Annette stamped the long sentiment form Stocking stamp set on two lines to fit in the heart! Perfect! Using Surface Tag Stamp Set, Starry Night Stamp Set, Be My Guest Stamp Set Shelly says: For my stamp layering I decided to overlap all my smaller stars in different shades of blue. Shelly, you've done it again! We are amazed at how you take all the inspiration and make it into something so simple yet so unique and fun! We love how you layered the star stamps! Using Stocking Stamp Set, Doily Circle Stamp Set Laura Jane says: I used the many different images from the STOCKING stamp set to create a layered "one of a kind" stocking:) Just a bit of masking magic allowed for flawless ink color changes. The Doily Circle stamp set added an extra layer of goodness to my card base. We love that Laura Jane leaves the images uncolored - the "hand-drawn" look adds so much to a Christmas card. Did you see that doily flower stamp peeking from the top right corner? So fun! ___ Aren't these cards fantastic? For more details, please click on the designer's name/link! Thank you for joining us today! Find time to create and make something today! Join the fun by linking your projects here! Hello everyone! We've noticed that Tribal Thank You stamp set is being ordered quite often lately so we wanted to share more ideas for this set! We challenged our design team member Lorena to combine this set with our current Challenge! Isn't it a challenge?! Let's check out what she's created for us! Happy Monday, friends! Lorena here with some new ideas for Tribal Thank You stamp set. This set was released last October but if you thought it was just intented for Thanksgiving or Fall projects, I hope with today’s ideas I’ll prove you wrong J Let’s start with a card. My inspiration came from the colors from the current Waffle Flower Crafts Challenge (you still have time to enter!). Here, I started stamping a graphic pattern with the small rectangle pattern stamp from the set. Who would say you could get such a big impact from this tiny stamp? 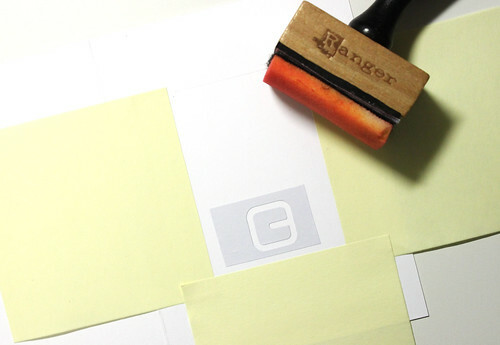 Next, I die cut the rectangle from Surface – Tag Die – Scallop Add-on twice from vellum. On one of the pieces I stamped and heat embossed the sentiment, and then I adhered them together slightly offset and placed them over one of those tangled floss ornaments that are so popular these days. Dang, this gold floss is a really wild thing, it was hard to tame it so it would stay in place, ha! And here’s one final pic of our card happily paired with an envelope and ready to travel in the post. I also made two tags with Tribal Thank You stamp set. I had one of those epiphany moments when I realized that the tree from the set pairs beautifully with the pots from Planted stamp set with just a little masking. Both of the tags were die cut with the largest die in Surface – Tag Die – Starter kit. I also made coordinating hole reinforcers stamping the die cut reinforcers with the polka dot circle from Flower Circles stamp set. I love the whimsical touch the polka dots add, but if you want to make this faster, you can simply cut the reinforcer from colored cardstock. In this first tag, I used the leaves and branches from the tree and made some selective inking so I could stamp the “thank you” in two lines. For the second tag I used the tree roots and I embellished the pot with a heart from Tribal Thank You covered with Glossy Accents. The sentiment is from the same set. And here they are happily hanging out side by side. There you are! Three Spring colored projects to brighten the new week. Thanks for stopping by! --- Wow is all we can say! Thank you so much for sharing your creativity with us, Lorena! We hope you can find time to create and make something today! Hello everyone! Welcome to Day 4 of Waffle Flower Crafts Twelve Days of Gift Giving! Today we have the super talented Elena Roussakis from Just ME Prints to share a handmade gift with us! I made a trio of santa bookmarks, one for each of my children. I thought it would be a fun gift, especially if I paired it with a book for each of them at Christmastime. I'm including a photo tutorial to help you see that you can make these too! step 1: you will need the following dies for this project. step 2: create a longer tag by running a 2" wide strip of red cardstock through the Big Shot as indicated. 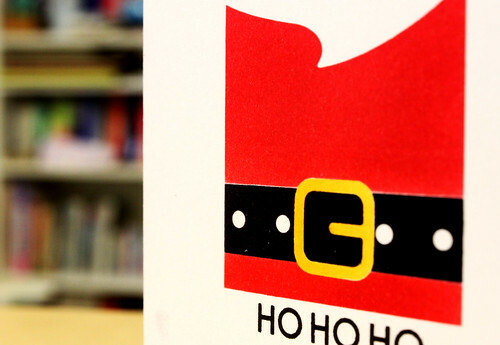 step 3: create Santa's mustache by cutting into an already-cut frame shape. step 4: trim the mustache, as we do not want Santa to sport a handlebar. step 5: cut off the ends - they will now be used as noses. step 6: these are all of the pieces cut (including the little speech bubble turned mouth that I omitted to show you before now.) step 7: add color: I used an E02 copic for the nose, and adhered it together with the mustache and mouth. then, I used E00 and R20 copic markers to add color to the face and blushy cheeks. once you have done this, adhere everything together. optional: add a pom pom to the top. I hope you like what I created! I had so much fun using these Waffle Flower dies! _______________________________________________________________ Aren't they just fun? Thanks Elena for sharing your talent with us! A Simple Thank You Card & the Winners! Hello everyone! Popped in to share a card I made last night and to announce the winners of our Instagram Thank You Giveaway. I was browsing our store and thought that I should make a real sample from our idea sheets. And I picked the very first one that came up: the idea sheet for 100% Love Stamp Set. This is a fun little 2"x3" set that can add a lot to our projects! I pulled out the set as well as the Surface - Tag Stamp Set that has the solid mini tag image to pick some colors. I catalog all my ink colors on a 1 page color chart. I have multiple charts for each brand but you can also download a blank page for your own ink collection here: Download a blank hand color chart here. I first stamped the thank you circle on a piece of sticky note and cut out to use as a mask. Then I stamp the circle again on the front of my white card base. Put the mask on top of the other circle to "mask" it and stamp the tag image on top. Remember when masking, always stamp the image that will be on top first. I used dye ink for the circle and the tag because they dry fast. Then I needed a pigment ink that will dry on top of the surface so the color can show up. Electric Pink for the tag string! Then I finished the card with a sentiment "for everything" from our Tribal Thank You Stamp Set and a few hearts from 100% Love Stamp Set. Can't help but bling them up with a glitter pen! And the sentiment is exactly what I want to say to you guys! Thank you for being excited, being supportive and helping us spread the word! You are the best! Congratulations, @mrsfda and your friend @queenpreneur. Please send us your choice of a stamp set and your snail mail address to claim your prize! We will also try to contact you on Instagram! Thank everyone for joining us! You are the BEST! Hello everyone! How time flies! We are releasing our new collection in 5 days! Popped in to share five of my recent favorites from our design team. Click on the photos will direct you to their posts for the details! Enjoy! Riverside Die Set (trees)[/caption] So amazing!!! We are grateful to have these talented ladies on board! Thank you for stopping by! Happy Crafting! Hello everyone! We have another guest designer today! I have been a Pamela fan ever since I found her on Moxie Fab World when she was a winner to a challenge. I am amazed by how much effort she puts in to achieve a clean look, over and over. There are always clever uses of products as well. I was on Neat and Tangled's team with her and am so happy for her stamp design debut with them! Such talent! Now, take it away, Pamela! Hello everyone! This is Pamela and I'm so excited to be guest designing for Waffle Flower's August release! 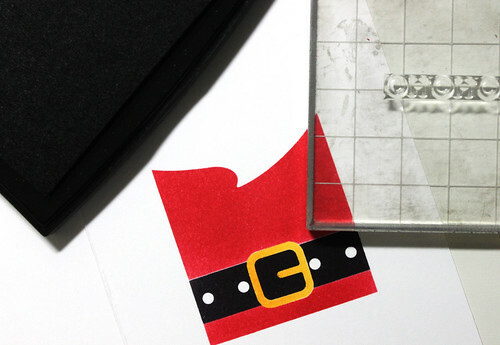 I'm using the new Surface - Tag Die - Santa Add-On die and I will be doing a lot of masking for a simple, one layer card. I first die cut everything on some masking paper. I first adhered the buckle negative onto my card base and I will be blending some yellow ink onto my card base. 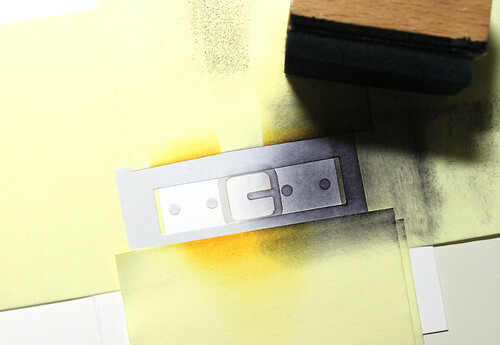 I then adhered the buckle's positive mask directly onto the yellow and discarded the buckle's negative mask. Then it was time for me to adhere the belt's negative mask and blended some black ink. After, I adhered the belt's positive mask and discarded the negative mask. I adhered the bottom part of the beard mask and blended the remaining in red. 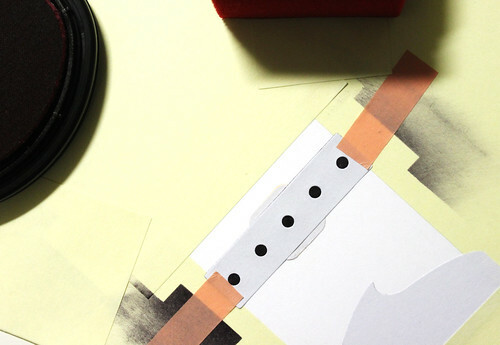 It's time to rip off all those masks and post-it notes! I'm now left with some simple shapes that suggests Santa Claus! 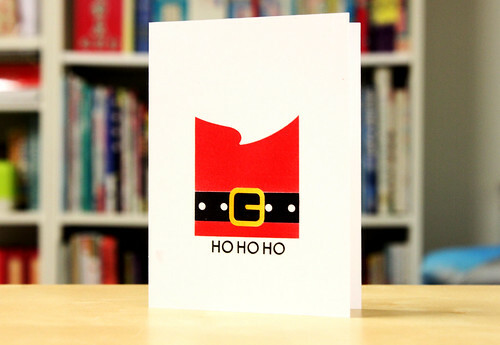 I inked up the "HO HO HO" sentiment from A Homemade Christmas and stamped it on the bottom to finish the card off. Here's the complete card! I love how flat and mail-friendly this card is! Of course you could always die cut it in coloured cardstock but this masking/blending/planning process was so fun! Here's a close up of the card. I'm in love with those vibrant colours! Thank you Nina for inviting me to guest design with her amazing stamps and dies!